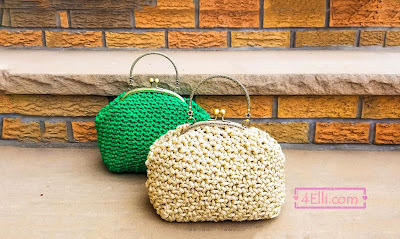 How to crochet beautiful metallic frame handbags with front&back sc stitch!!! 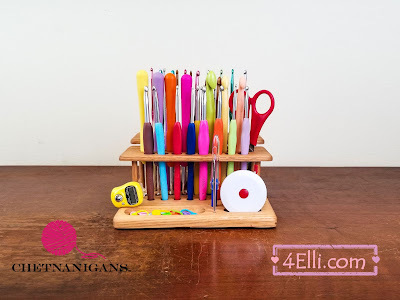 Did you see my new crochet hook stand from www.Chetnanigans.com?? A master piece which every crocheter must have!! To begin make a slip knot and chain 15. In the end of row 21 we start working in rounds. *Watch my video tutorial for more information about the size of bottom and how to adjust it. Round 19: 1sc in each of next 2 stitch, 2sc together around. In the end of round 19 slip stitch to the 1st, cut the yarn and finish your work. Watch my video tutorial if you don't know how to sew the frame!